The accommodatio at the Wellington Apartment Hotel is very popular because guests can get all the conveniences of self catering facilities without the high accommodation costs. The Wellington Apartment Hotel offers travellers the choice of luxuriously appointed refurbished hotel and studio apartment accommodation. The property is positioned in the trendy Brisbane suburb of Kangaroo Point and has friendly service and stunning city views. 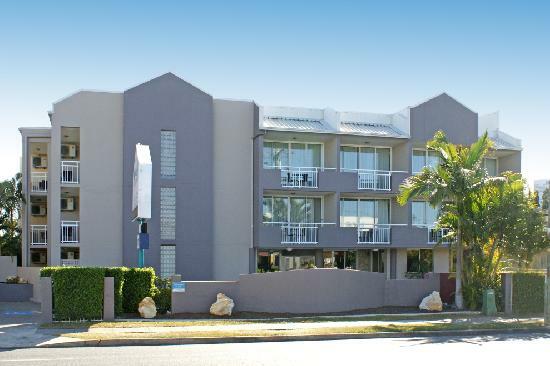 If you need value for money hotel accommodation in Brisbane then The Wellington Apartment Hotel is the ideal choice. This affordable hotel features a variety of rooms that are designed for both business and leisure travellers as well as great amenities like lounge bar, conference centre, direct internet access, disabled facilities, free car parking, guest laundry, lift, restaurant, room service, outdoor swimming pool, tour desk, bbq, garden, baby cots for families and daily housekeeping. The Wellington on Wellington restaurant at this property provides superb cuisine which will satisfy the most discerning palate, as well as a casual lounge bar that is ideal for pre and post dinner drinks. King/Twin Hotel Room : Sleeps up to 2 guests on 1 King Bed or 2 Single Beds. Queen Studio Apartment : Sleeps up to 4 guests on 1 Queen Bed & Roll Away Bed. Studio Apartment : Sleeps up to 4 guests on 1 Queen Bed & Roll Away Bed.